Lang Ford 1/2'' Fuel Line and Vapor Removal Connection Tool is designed for the removal of Ford type 1 & 2 quick release connectors and Super Duty Truck Fuel supply line quick connectors that are found on the majority of Ford Vehicles from 2005 to now. Lang Small Engine Valve Spring Compressor. Compress valve springs on overhead valve and L-head engines on cars, trucks and tractors. Long and slender, maximum opening 2-3/8. Will reach into small recesses. Lang Valve Spring Compressor. Compress valve springs on overhead valve and L-head engines on cars, trucks and tractors. 9-3/4 Throat depth, and jaw openings of 2-3/4 to 7-3/4, 2 straight jaws included. Lang Valve Spring Compressor. Compress valve springs on overhead valve and L-head engines on cars, trucks and tractors. Designed for light-weight valve springs 6-1/4 Throat depth, and jaw openings of 3 to 5-3/8. Lang Ford Seatbelt Pretensioner Release Tool allows for the disconnection of the Ford Interceptor, Taurus, and Lincoln MKS seat belt pretensioner system and simplifies the disconnection of the seatbelt release mechanism. Lang Glow Plug Harness Tool prevents damage to the harness and connector rail and removes and installs glow plug connectors. Applications include 2004 and newer: 6.0 Liter Diesel, E-Series, Low Cab Forward, and F250-F350 Super Duty. Lang Magnetic Socket Inserts (Sae), 9 Piece. Includes nine pieces: 3/8, 7/16, 1/2, 9/16, 5/8, 11/16, 3/4, 13/16, and 7/8. Prevents fasteners from dropping into restricted areas where they can be difficult to locate and/or retrieve. Lang Magnetic Socket Inserts (Metric), 10 Piece. Includes ten pieces: 10, 11, 12, 13, 14, 15, 16, 17, 18, and 19mm. Prevents fasteners from dropping into restricted areas where they can be difficult to locate and/or retrieve. Lang Magnetic Socket Inserts (Sae & Metric), 19 Piece. Includes nineteen pieces: 520 and 521 combined. Prevents fasteners from dropping into restricted areas where they can be difficult to locate and/or retrieve. Lang Tilt Steering Pivot Pin Remover. Removes pivot pins from Chrysler, Ford, and GM steering columns. Fits all telescoping steering columns (1969 to present). Lang Ford Fuel Filter Cap Tool. Works on Ford 36mm cartridge style oil filters and fuel filters which use 36mm & web cartridges. 36mm hex, combined with 6 notches allows this tool to do the work of two. Lang Maxxforce Fuel Line Release Tool is designed for fuel line disconnect for International MaxxForce Engines Series 11 and 13. Lang Maxxforce Fuel Line Release Tool is heat treated to minimize fork deflection. Lang Ford 3/8'' Fuel Line and Vapor Removal Connection Tool is designed for the removal of Ford type 1 & 2 quick release connectors and 5/16'' & 3/8'' fuel supply and vapor line quick connectors found on the majority of Ford Vehicles from 2005 to now. Lang Camshaft Sprocket Holding Tool features a pivoting design that allows fit in most cam and injection pump gear sizes, the dented groves on holding pins gives use a sure hold, and use as a counter holder when working on sprocket retainer bolts. Lang Universal Seal Puller Kit features a pin that creates a pivot point on the surface of the seal which distributes the force evenly over a larger surface area. Greater surface area on hook helps prevents seal puller from piercing through the seal. Lang Gasket Hole Punch Set, 11 Piece. Designed to cut holes and internal radii in gaskets and other soft material (i.e., rubber, lead foil, linoleum, felt fiber). Ten Punch Sizes. Lang Piston Ring Groove Cleaner. Effectively removes carbon from ring grooves on pistons 2 to 5 (51mm to 127mm). Cutters rotate to any selected size, locking in place with hold-down nut. 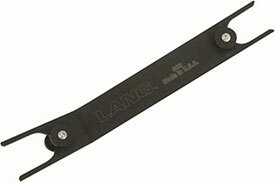 Lang Steel Wheel Lock-Plate Remover/Installer. Features puller yoke to fit late model GM cars with (S.I.R.) air bags. Narrow yoke prevents damage to the lock plate. Lang Oxygen Sensor/Vac Switch Socket. Multi-purpose socket used for removal and replacement of oxygen sensors, vacuum switches and PVS, TVS valve sockets as found on Ford, General Motors, Chrysler, and some foreign vehicles. Lang Piston Ring Compressor. Double tension band with gear ratchet. Stronger locking mechanism and quick release. For use with major vehicle platforms, domestic and foreign. Ring capacity 2-1/8 to 5; depth 3-1/2. Lang Valve Spring Compressor. Compress valve springs on overhead valve and L-head engines on cars, trucks and tractors. 7-1/2 Throat depth, and jaw openings of 2-3/4 to 5-7/8. Lang Exhaust Hanger Removal Pliers. For removal of rubber exhaust system hangers, (i.e. tailpipe, exhaust pipe and muffler) Self-locating forcing pin. Handles at a 25 offset for easy access in restricted areas. Lang Clutch Master Cylinder Pin Press. Service the clutch master cylinder and hydraulic lines without having to remove the whole clutch master cylinder assembly. Lang Universal Oil Filter Wrench . Designed to fit oil filters for all domestic and foreign compact, mid- and standardsized automobiles. Self-adjusting wrench will fit all filters 2-1/2 through 3-13/16 in diameter. The 563 Lang Ford 1/2'' Fuel Line and Vapor Removal Connection Tool is one of thousands of quality tooling products available from MRO Tools. Please browse Lang Automotive Service Tools for tools similar to the 563 Lang Ford 1/2'' Fuel Line and Vapor Removal Connection Tool. 563 Lang Ford 1/2'' Fuel Line and Vapor Removal Connection Tool description summary: Lang Ford 1/2'' Fuel Line and Vapor Removal Connection Tool is designed for the removal of Ford type 1 & 2 quick release connectors and Super Duty Truck Fuel supply line quick connectors that are found on the majority of Ford Vehicles from 2005 to now. Quantity discounts may be available for the 563 Lang Ford 1/2'' Fuel Line and Vapor Removal Connection Tool. Please contact MRO Tools for details.